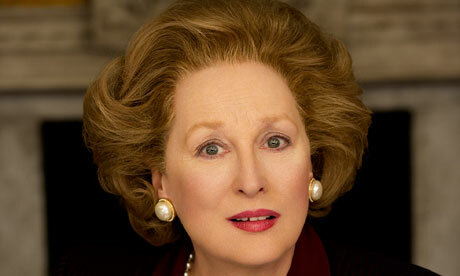 I can’t write a political or historical retrospective on Thatcher, on her life or her works. If I did, it might come out like the Russell Brand piece, only a bit more Northern, a bit more reflective on her impact on feminism. I’ve read and seen far too much already over the past few days, from endless eulogies in the papers through to angry words on the street and in the House of Commons. The truth is I am genuinely shaken by it. Like the Queen Mother, she was one of those figures we all suspected might go on forever, and her shadow was long. With it gone, one of the touchpoints for my personal politics is gone. I started to think about how I might even begin to parse what has happened: I’m not sad, but I’ll admit I didn’t crack open the champagne personally; I merely drank someone else’s.So in a similar vein, I wanted to write not about her, but about representations of her. I’m going to start with one of my favourite political cartoonists. Alongside his later portrayal of her puppeteering Tony Blair, comic artist Steve Bell also focuses on her controlling authority. 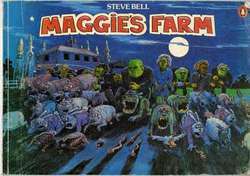 He wrote a series called Maggie’s Farm which depicted her as completely insane – with trademark wonky eye and multiple exclamation points in her speech. The comics, which reference Dylan’s song of the same title (which was in itself used as a protest song against Thatcher) were originally published in Time Out from 1979, and, to my eye, probably heavily influenced later depictions. The first time I saw Spitting Image I was hooked, probably helped by the fact my parents told me I wasn’t allowed to watch it, and to this day I regret that it has gone off the air. Perhaps it’s because no satire is strong enough to be distinguished from the ridiculous facts of today’s government? Anyway, back to Thatcher. The depiction of her was grotesque, but no more so than that of any other puppet on the show. That said, it was the nature of the grotesque that interested me. She was ridiculed for her strength and controlling nature in the form of a horrific headmistress. It’s interesting to note that later John Major was ridiculed for his lack of strength. But rather than this being portrayed as an essential part of her it was represented in reference to Thatcher as a woman (note the ongoing references to her as “sir”). Her strength was ridiculed, in part, by presenting it as “unfeminine” and therefore funny or dangerous: a stereotype of women in politics that will no doubt take many years to overturn. As the series moved on she became less and less human, eventually turning into an alien monster. Raymond Briggs delivers a rendition of the Falklands War in a way that is moving, vitriolic, frightening and humbling in his 1984 piece The Tin Pot Foreign General and The Old Iron Woman. What I find particularly interesting here is how her depiction contrasts with that of Spitting Image. 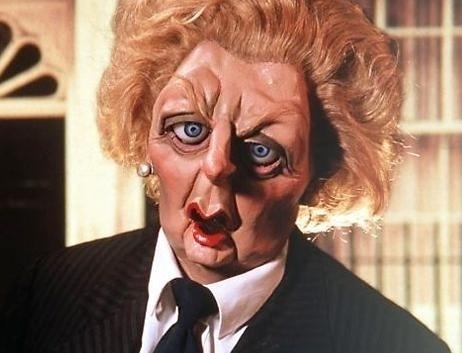 Both use the “non-human” references, but whereas the Spitting Image Thatcher is usually either asexual or very masculine, here she is quite the opposite. Guns and victory explosions fire from her breasts as she squats (in high heels, with rounded buttocks and suspenders, no less) over her land and nation in a parody of birth. The conflation of female and war-machine gives rise to a gross, highly sexualised fembot. I returned from holiday just over a year ago to find London distressingly covered in images of Meryl Streep in The Iron Lady, with her icy blue eyes following me all over the place. It haunted me, in much the same way as it did our Rhian Jones (I’ll admit it, I couldn’t bring myself to see the film). It was the glossiness of the whole thing that threw me, the vogue-ish fashion magazine stylings that worked their hardest to reunite those twin features of “female” and “powerful” which had created such horrors through both Spitting Image and at the pencil of Raymond Briggs. And they succeeded in being very flattering, through a combination of make-up and airbrushing. Streep is noticeably less wrinkled and more attractively-styled than Thatcher, looking eerily like a better-looking sister. The situation was enhanced by Streep’s own acting ability, and a script which included scenes of feminine domesticity. I never knew her. Never met her. I only understood her as a series of images and icons, on the television as a politician and in other representations of her, which are more numerous than I can contain in one article. Buzzfeed, for example, collected a list of songs about her. Like many other dead, famous people, over time she will fade from a real person, who nonetheless was one of the bogeymen of my childhood (alongside the boggle-faced baddie animals in Orm and Cheep) to being almost imaginary, an icon. To me, she will always be the figurehead for all that is wrong with right wing thinking and the sort of “feminism” that claims it must be feminist if a woman is doing it. Those with opposing politics have put her on a pedestal. Other people will make her into other things. I doubt we’ve seen the last representation, but I’ll be interested which version of Margaret Thatcher will stand the test of time, and which version we will be faced with next.